Research background: Contemporary research on industry concentrates on the relations between enterprises and their environment. Research on industrial structures conducted throughout the world, including Poland, are not extensive and limited due to the confidentiality of statistics. K. Pavitt (1984) was the first researcher who evaluated the relationship between industry structure and innovation activity. According to Pavitt, innovation dynamics and trajectory depend on the structure of domestic industry and is unique. In Poland T. Rachwal (2010) determined that over the studied years, changes in the indicator defining diversification in industrial divisions were minimal, but at the same time there was an observable fall in the importance of traditional divisions, such as the production of clothing, textiles, and the leather. In contrast, divisions as the production of metal, rubber, and plastic goods increased their share in terms of employees, as did furniture and vehicle manufacturing. 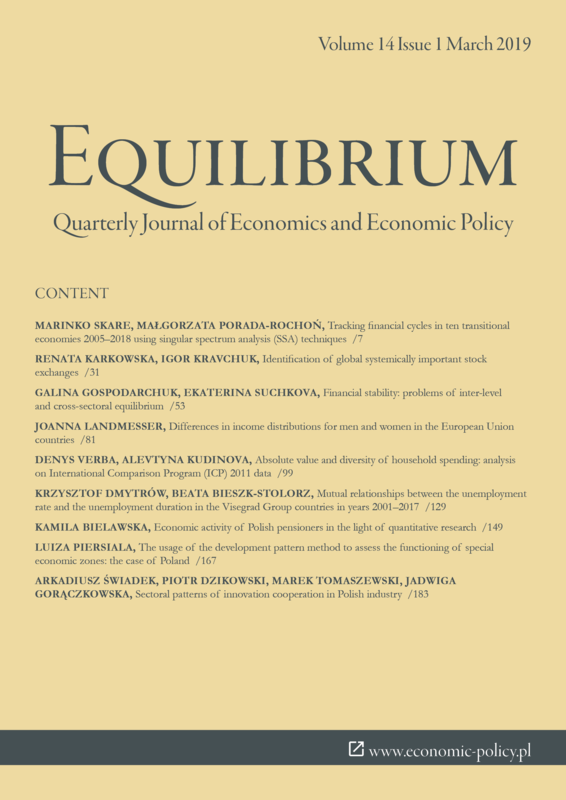 Purpose of the article: The purpose of the paper is to identify sectoral patterns of innovation cooperation as revealed by data on about 5209 Polish enterprises. The authors attempt to find the answer to the following three questions: (1) Is the domestic aggregation sufficient for stimulating innovation cooperation in the Polish industry? (2) Is there any sectoral heterogeneity in innovation cooperation? (3) Are enterprises representing high technology industries the most involved in innovation cooperation? The main goal of the study was an attempt to seek out the directions and influence of various industries on the innovation cooperation of enterprises in Poland. Methods: Empirical data that served as the basis for conducting calculations were collected with the help of a questionnaire survey sent to industrial companies throughout Poland. A total of 5,209 properly completed forms were collected. The average rate of return was 11,6%. The collection was held over the years 2008–2013. The methodological part of the study was developed using the logistic regression method based on probability theory of the study. Findings & Value added: The study has shown that the higher the technology, the more often enterprises cooperate in the area of innovation. The research has not only shown the specifics of the domestic industrial system as well its level of technological advancement, but it has also taken into account the significance and input into the analyzed system. Ahuja, G. (2000). Collaboration networks, structural holes, and innovation: a Longitudinal Study. Administrative Science Quarterly, 45(3). doi: 10.2307/2667 105. Aldrich, J. H., & Nelson, F. D. (1984). Linear probability, Logit, and Probit models. SAGE Publications Ltd.
Archibugi, D., & Iammarino, S. (2002). The globalization of technological innovation: definition and evidence. Review of International Political Economy, 9(1). doi: 10.1080/09692290110101126. Belderbos, R., Carree, M., Diederen, B., Lokshin, B., & Veugelers, R. (2004). Heterogeneity in R&D cooperation strategies. International Journal of Industrial Organization, 22(8–9). doi: 10.1016/j.ijindorg.2004.08.001. Belderbos, R., Van Roy, V., & Duvivier, F. (2013). International and domestic technology transfers and productivity growth: firm level evidence. Industrial and Corporate Change, 22(1). doi: 10.1093/icc/dts012. Bouncken, R. B., & Fredrich, V. (2012). Coopetition: performance implications and management antecedents. International Journal of Innovation Management, 16(05). doi: 10.1142/S1363919612500284. Candi, M., Ende, J., & Gemser, G. (2016). Benefits of customer codevelopment of new products: the moderating effects of utilitarian and hedonic radicalness. Journal of Product Innovation Management, 33(4). doi: 10.1111/jpim.12286. Carayannis, E. G., & Alexander, J. (1999). Winning by co-opeting in strategic government-university-industry R&D partnerships: the power of complex, dynamic knowledge networks. Journal of Technology Transfer, 24(2–3). Carvalho, L., Madeira, M. J., Carvalho, J., Moura, D. C., & Duarte, F. P. (2018). Cooperation for innovation in the European Union: outlook and evidences using CIS for 15 European countries. Journal of the Knowledge Economy, 9(2). doi: 10.1007/s13132-018-0520-6. Chen, M.-J. (1996). Competitor analysis and interfirm rivalry: toward a theoretical integration. Academy of Management Review, 21(1). doi: 10.2307/258631. Chung, S., & Kim, G. M. (2003). Performance effects of partnership between manufacturers and suppliers for new product development: the supplier’s standpoint. Research Policy, 32(4). doi: 10.1016/S0048-7333(02)00047-1. Cohen, W. M., & Levinthal, D. A. (1989). Innovation and learning: the two faces of R&D. Economic Journal, 99(397). doi: 10.2307/2233763. Cohen, W. M., & Levinthal, D. A. (1990). Absorptive capacity: a new perspective on learning and innovation. Administrative Science Quarterly, 35(1). doi: 10.2307/2393553. Cui, A. S., & Wu, F. (2015). Utilizing customer knowledge in innovation: antecedents and impact of customer involvement on new product performance. Journal of the Academy of Marketing Science, 44(4). doi: 10.1007/s11747-015-0433-x. Dosi, G. (1982). Technological paradigms and technological trajectories. Research Policy, 11(3). doi: 10.1016/0048-7333(82)90016-6. Dosi, G. (1988). The nature of the innovation process. In Technical change and economic theory. London/New York: Pinter Publishers. Dzikowski, P. (2015). Sources of information for innovation and innovation activities in the high technology sector in Poland. Global Management Journal, 7(1-2). Europäische Kommission, & Statistisches Amt (2008). NACE Rev. 2 statistical classification of economic activities in the European Community. Luxemburg. Evangelista, R., Perani, G., Rapiti, F., & Archibugi, D. (1997). Nature and impact of innovation in manufacturing industry: some evidence from the Italian innovation survey. Research Policy, 26(4–5). doi: 10.1016/S0048-7333(97)00028-0. Fleming, L. (2001). Recombinant uncertainty in technological search. Management Science, 47(1). doi: 10.1287/mnsc.47.1.117.10671. Freel, M. S. (2003). Sectoral patterns of small firm innovation, networking and proximity. Research Policy, 32(5). doi: 10.1016/S0048-7333(02)00084-7. Freeman, C. (1989). Technology policy and economic performance. Lessons from Japan. London: Pinter Publishers. Furman, J. L., Porter, M. E., & Stern, S. (2002). The determinants of national innovative capacity. Research Policy, 31(6). doi: 10.1016/S0048-7333(01)00152-4. Gadde, L.-E., & Snehota, I. (2000). Making the most of supplier relationships. Industrial Marketing Management, 29(4). doi: 10.1016/S0019-8501(00)00109-7. Geffen, C. A., & Rothenberg, S. (2000). Suppliers and environmental innovation: the automotive paint process. International Journal of Operations & Production Management, 20(2). doi: 10.1108/01443570010304242. Glimstedt, H., Bratt, D., & Karlsson, M. P. (2010). The decision to make or buy a critical technology: semiconductors at Ericsson, 1980–2010. Industrial and Corporate Change, 19(2). doi: 10.1093/icc/dtq011. Handfield, R. B., Ragatz, G. L., Petersen, K. J., & Monczka, R. M. (1999). Involving suppliers in new product development. California Management Review, 42(1). doi: 10.2307/41166019. Harbison, J. R., & Pekar, J. P. (1998). Smart alliances: a practical guide to repeatable success. Jossey-Bass. Heidenreich, M. (2009). Innovation patterns and location of European low- and medium-technology industries. Research Policy, 38(3). doi: 10.1016/j.respol. 2008.10.005. Henke, J. W., & Zhang, C. (2010). Increasing supplier-driven innovation. MIT Sloan Management Review; Cambridge, 51(2). Hirsch‐Kreinsen, H., Jacobson, D., & Robertson, P. L. (2006). ‘Low‐tech’ industries: innovativeness and development perspectives — a summary of a European research project. Prometheus, 24(1). doi: 10.1080/08109020600563762. Johnsen, T. E. (2009). Supplier involvement in new product development and innovation: Taking stock and looking to the future. Journal of Purchasing and Supply Management, 15(3). doi: 10.1016/j.pursup.2009.03.008. Liao, T. F. (1994). Interpreting Probability Models. Logit, Probit, and Other Generalized Linear Models (101). SAGE Publications Ltd.
Lundvall, B.-Å. (1992). National Systems of Innovation: Towards a Theory of Innovation and Interactive Learning. London: Pinter. Malerba, F. (1992). Learning by firms and incremental technical change. Economic Journal, 102(413). doi: 10.2307/2234581. Malerba, F. (2002). Sectoral systems of innovation and production. Research Policy, 31(2). doi: 10.1016/S0048-7333(01)00139-1. Malerba, F. (2005). Sectoral systems of innovation: a framework for linking innovation to the knowledge base, structure and dynamics of sectors. Economics of Innovation and New Technology, 14(1–2). doi: 10.1080/104385904200022 8688. Malerba, F., & Mani, S. (2009). Sectoral systems of innovation and production in developing countries: actors, structure and evolution. Edward Elgar Publishing. Mowery, D. C., & Nelson, R. R. (1999). Sources of industrial leadership: studies of seven industries. Cambridge: Cambridge University Press. Nelson, R., & Winter, S. G. (1982). An evolutionary theory of economic change. Cambridge: Harvard University Press. Nelson, R. (1993). National innovation systems: a comparative analysis. Oxford University Press. Nishiguchi, T., & Ikeda, M. (1996). Suppliers’ process innovation: understated aspects of Japanese industrial sources. In Managing product development. New York/Oxford: Oxford University Press. Pavitt, K. (1984). Sectoral patterns of technical change: towards a taxonomy and a theory. Research Policy, 13(6). doi: 10.1016/0048-7333(84)90018-0. Pittaway, L., Robertson, M., Munir, K., Denyer, D., & Neely, A. (2004). Networking and innovation: a systematic review of the evidence. International Journal of Management Reviews, 5–6(3–4). doi: 10.1111/j.1460-8545.2004.00101.x. Quintana-García, C., & Benavides-Velasco, C. A. (2004). Cooperation, competition, and innovative capability: a panel data of European dedicated biotechnology firms. Technovation, 24(12). doi: 10.1016/S0166-4972(03)00060-9. Rachwał, T. (2010). Struktura przestrzenna i działowa przemysłu Polski na tle Unii Europejskiej w dwudziestolecie rozpoczęcia procesów transformacji systemowej. Prace Komisji Geografii Przemysłu Polskiego Towarzystwa Geograficznego, 16. Reichstein, T., & Salter, A. (2006). Investigating the sources of process innovation among UK manufacturing firms. Industrial and Corporate Change, 15(4). doi: 10.1093/icc/dtl014. Robertson, P. L., & Patel, P. R. (2007). New wine in old bottles: technological diffusion in developed economies. Research Policy, 36(5). doi: 10.1016/j.re spol.2007.01.008. Sawhney, M., Verona, G., & Prandelli, E. (2005). Collaborating to create: the Internet as a platform for customer engagement in product innovation. Journal of Interactive Marketing, 19(4). doi: 10.1002/dir.20046. Schiavone & Simoni (2011). An experience‐based view of co‐opetition in R&D networks. European Journal of Innovation Management, 14(2). doi: 10.1108/ 14601061111124867. Schiele, H. (2006). How to distinguish innovative suppliers? Identifying innovative suppliers as new task for purchasing. Industrial Marketing Management, 35(8). doi: 10.1016/j.indmarman.2006.05.003. Singh, J., & Fleming, L. (2009). Lone inventors as sources of breakthroughs: myth or reality? Management Science, 56(1). doi: 10.2139/ssrn.1299064. Srholec, M. (2014). Cooperation and innovative performance of firms: panel data evidence from the Czech Republic, Norway and the UK. Journal of the Knowledge Economy, 5(1). Srholec, M. (2015). Understanding the diversity of cooperation on innovation across countries: multilevel evidence from Europe. Economics of Innovation and New Technology, 24(1–2). doi: 10.1007/s13132-013-0175-2. Stanisz, A. (2016). Modele regresji logistycznej Zastosowania w medycynie, naukach przyrodniczych i społecznych. Kraków: StatSoft Polska. Stock, G. N., Greis, N. P., & Fischer, W. A. (2002). Firm size and dynamic technological innovation. Technovation, 22(9). doi: 10.1016/S0166-4972(01)00061-X. Świadek, A. (2013). Industry Chains for Innovativenes of Peripheral Regions in Poland. Ekonomika i Organizacja Przedsiębiorstwa, 10. Teece, D. J., Pisano, G., & Shuen, A. (1997). Dynamic capabilities and strategic management. Strategic Management Journal, 18(7). doi: 10.1002/(SICI)1097-0266(199708)18:7<509::AID-SMJ882>3.0.CO;2-Z. von Hippel, E. (1988). The sources of innovation. New Jork: Oxford University Press. von Hippel (2005). Democratizing innovation: The evolving phenomenon of user innovation. Journal Für Betriebswirtschaft, 55(1). doi: 10.1007/s11301-004-0002-8. von Hippel, E. (2007). Horizontal innovation networks — by and for users. Industrial and Corporate Change, 16(2). doi: 10.1093/icc/dtm005. Westerlund, M. & Rajala, R. (2010). Learning and innovation in inter‐organizational network collaboration. Journal of Business & Industrial Marketing, 25(6). doi: 10.1108/08858621011066026. Wynstra, F., Axelsson, B., & Weele, A. V. (2000). Driving and enabling factors for purchasing involvement in product development. European Journal of Purchasing & Supply Management, 6(2). doi: 10.1016/S0969-7012(00)00002-2. Yu, L. (2008). Collaborating With the Right Partners. MIT Sloan Management Review; Cambridge, 50(1).